Thanks for participating, everyone! 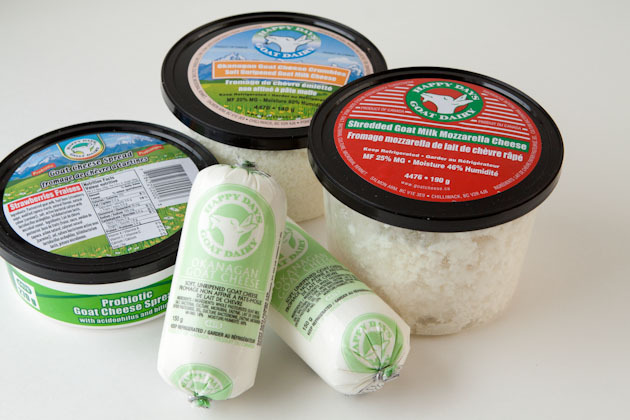 Congratulations to Suzanne H, the winner of $50 worth of goat dairy goodies! Happy Days has just recently launched a new website and has asked me to contribute to their inspirations program – a place where I’ll share my healthy, gluten-free goat dairy recipes for followers of HP and Happy Days. I couldn’t be more thrilled about this partnership and look forward to sharing more goat dairy goodies with you all ;) ~~~~~~~~~~~~~~~~~~~~~~~~~~~~~~~~~~~~~~~~~~~~~~~~~~~~~~~~~~~~~~~~~~ We like to entertain, socialize, and serve up great food when doing it. As a hostess, I like to make sure that each person that visits our home enjoys the food and can find a little bit of something that is normal to them. When I first started entertaining, I would create all these crazy gluten-free, dairy-free, vegan, corn-free, grain-free meals and appetizers with crazy ingredients like coconut oil, spirulina, homemade nut milk, and arrowroot starch. I’d introduce the meals to people and get a bunch of blank stares back. Note that it can sometimes overwhelm your guests if you introduce them to too many foreign ingredients during their visit. Overtime I’ve come to find balance in the appetizers, meals, and desserts we serve to our friends and family. A bit of dairy here, some gluten there, vegan fare, and a touch of grain-free, goes a long way in introducing our loved ones to healthy eating without forcing them to step too much out of their comfort zone. While I’ve tried to reintroduce dairy into my life on multiple occasions, I just can’t seem to tolerate it over long periods of time. I understand that there are readers, friends and family out there that can handle their dairy and are always looking for ways to incorporate healthier dairy options into their daily lives. Because of that, I often cook with it at home when we have friends over, and continue to come up with new and exciting ways to incorporate it into the recipes I create. With all of this in mind, when Happy Days Goat Dairy asked me if I’d be interested in partnering up with them on a bunch of new and exciting initiatives this Summer, I jumped at the chance. Happy Days is a local, 100% Canadian goat milk company who takes the utmost care and attention into the quality of their products. 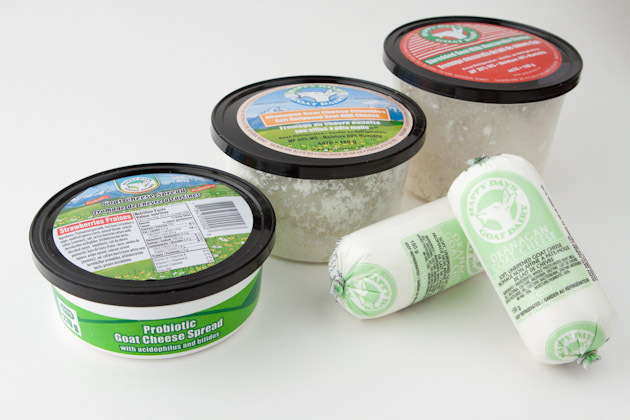 Their product line-up includes a wide variety of delicious goat cheese products, and yogurt products. All of their products are guaranteed to be free of hormones and antibiotics. Bio-availability. Goat’s milk is closer to human’s milk making it easier to digest and assimilate than cow’s milk. In fact, over 50% of people with lactose intolerance to cow’s milk don’t have an issue with goat’s milk. Metabolic agent. Studies have shown that goat’s milk helps to increase your ability to metabolize certain minerals. Naturally low fat. Goat’s milk is lower in fat than cow’s milk but still maintains a high fatty acid and amino acid profile. Being naturally low in fat means that the milk doesn’t have to go through as much processing as cow’s milk does. Also, because it’s low in fat, goat’s milk isn’t as mucus forming as cow’s milk. High in fatty acids. Goat’s milk has two times the fatty acids than cow’s milk. Environmentally friendly. Goats require less space than cows and create far less waste. Cleaner option. Goat’s are rarely shot up with the same amount of growth hormones and antibiotics making it a less toxic choice for your and your family. Goat’s milk and it’s products can be used in just about every recipe that calls for cow’s milk products. When I was planning to share a recipe with you using goat’s milk I wanted a recipe that was was grain-free, sugar-reduced, had a small list of ingredients, and could be easily adapted to be dairy-free for those that just can’t tolerate dairy no matter what they do! Of course it should come as no surprise that the recipe I came up with was a dessert and calls for lots of chocolate! 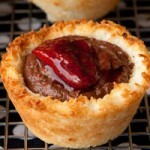 These tarts are easy to assemble, incredibly light, naturally sweet, and lick your fingers deeeelicious! 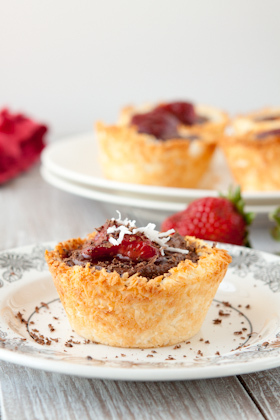 Low-sugar, grain-free chocolate cheesecake tarts made with local goat cream cheese. Dairy-free substitution included! Place chocolate for cheesecake filling in an oven safe dish and place on top of your oven. Keep it here to melt while baking the tarts and strawberries. Add egg whites to coconut and stir until fully coated. Spray a muffin tin with non-stick cooking spray (or dab of coconut oil) and press a large spoonful of coconut mixture into each cup, pushing it evenly into the bottom and up the sides. Let cool in muffin pan before removing and placing on a cooling rack until ready to use. Increase oven temperature to 375F and line a baking sheet with parchment paper. 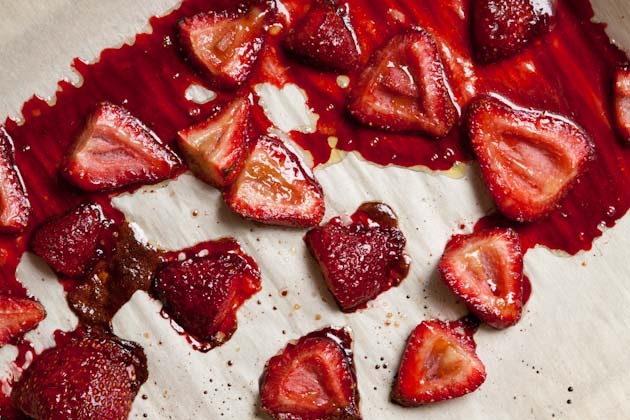 You’ll want to use parchment for this as the strawberries get really juicy and sticky. Set aside. In a medium-sized mixing bowl, add sugar, oil, vanilla, and salt. Once completely mixed, add cut strawberries and coat. Place strawberries on prepared pan and roast for 20-25 minutes, until juices thicken but are not burnt. Remove the berries and juice from the pan while still warm. Place in a small bowl, stir in balsamic vinegar, and set aside. Place cream cheese and milk to a small bowl. Stir until incorporated. Divide the cream cheese mixture evenly among the coconut cups. 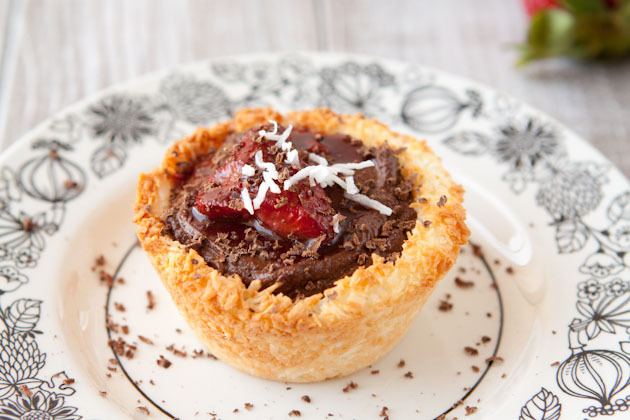 Top with roasted strawberries, extra coconut or chocolate shavings. Probiotic goat cheese spread is similar to cream cheese. For a dairy-free and vegan version, use my cashew cream cheese recipe and omit the goat milk completely from this tart recipe. I used whole eggs for the egg whites in this recipe, then used the leftover yolks in my smoothie the next day. When mixing the coconut and egg white, make sure that each piece of coconut has a bit of egg white on it. Press the mixture very firmly into the muffin tins. The more packed, the more successful you’ll be! While the grain-free tart shells are baking, get your strawberries ready! It was my first time roasted strawberries and will definitely not be my last. The finished product is like candy on a baking sheet. I had a hard time not gobbling up all of the strawberries right then and there! 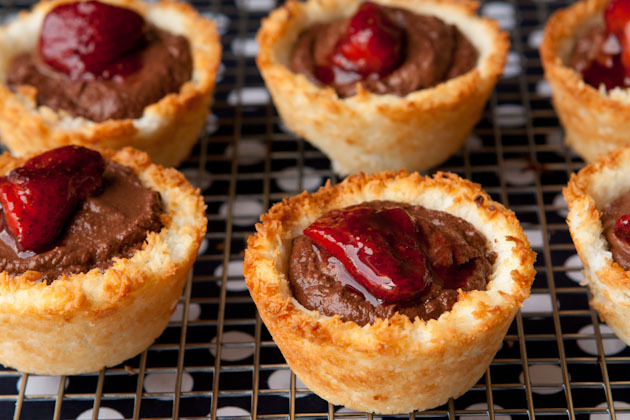 Once the shells are cooled and strawberries roasted, mix together your chocolate filling. 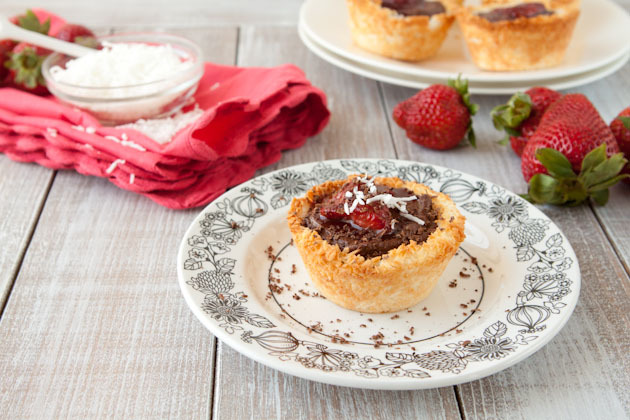 Drop the chocolate cream cheese filling into each tart shell, top with roasted strawberries, and voila! 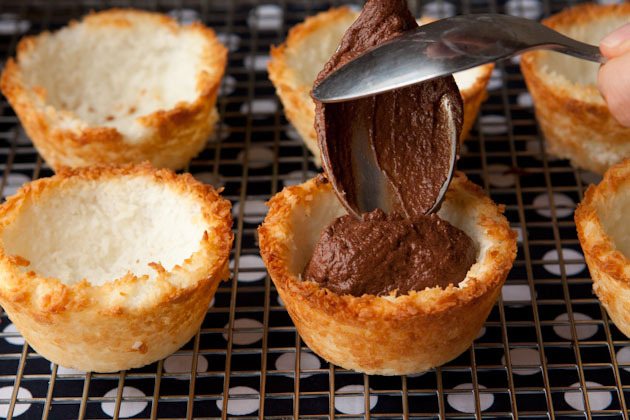 Dress the cheesecake tarts with some extra coconut, chocolate shavings, or enjoy as is. Okay, now for the fun part… Happy Days has offered to provide a $50 goat dairy gift basket to one lucky reader! Not only that, but all HP readers can take advantage of a $8.00 discount online orders over $20 by using the promotion code: HPJune2012. The opinions expressed herein are those of Healthful Pursuit and are not indicative of the opinions or positions of Happy Days Goat Dairy.